In front of a very sparse crowd, a fired-up Ukraine side beat an out-of-sorts U.S. squad, 2–0, in Cyprus. From the anthems on, it was clear that Ukraine intended to take this match very seriously, and was the dominant side for most of the game, taking advantage of a U.S. lineup with little experience playing together. After a well-observed moment’s silence, though, the game opened almost as quietly. Neither team was immediately dominant, with both probing between the boxes without much penetration. The U.S. team to start had Tim Howard in goal; Edgar Castillo, John Brooks, Oguchi Onyewu, and Geoff Cameron in defense; Jermaine Jones, Sacha Kljestan, Fabian Johnson, Clint Dempsey, and Alejandro Bedoya in midfield; with Jozy Altidore up top. In the 11th minute, Cameron got up the right hand side well, exchanging a one-two with Altidore, but his cross was not a good one. Almost immediately after, Ukraine went ahead. A ball over the top found a run from deep by Denis Garmash that wasn’t tracked by the midfield. Brooks, too close to Onyewu, couldn’t catch up, and Garmash was in. His shot was well-saved by Howard, but the ball came back to him, and he played in Andriy Yarmolenko for a tap-in. The goal marked a period of Ukrainian pressure, which nearly netted them a couple more. Yarmolenko on the right wing and his counterpart on the left, Yevhen Konoplyanka, constantly found themselves on the ball, either playing runners into the channels or running onto passes themselves. The U.S. was opened up multiple times, but was saved by the offsides flag or last-ditch defending. Onyewu, in the 25th, nearly diverted a Yarmolenko cross into his own net, but Howard was there to catch the deflected ball. As the clock approached 30 minutes, the U.S. seemed to settle somewhat, and found itself decent crossing opportunities from both flanks. On 27 minutes, one such ball from Cameron was dangerous, and nearly picked out U.S. runners in the box, but was well claimed by Andriy Pyatov, the Ukrainian goalkeeper. With the half closing, the U.S. tried to up its tempo, and began holding the ball better, but were unable to find a breakthrough before halftime. The U.S. made no changes at halftime, but may as well have been a completely different team in the early stages of the second half. Where in the first half the U.S. was turgid and tentative, in the second they played with aggression and quickness, and the combination resulted in a string of chances early on. In the 49th, with the U.S. probing into the Ukraine penalty area, a cross from Kljestan was headed away, but fell to Bedoya inside the box, whose shot deflected out for a corner. The corner didn’t result in a shot, but the U.S. maintained possession and pressure on Ukraine, and led to a another Cameron cross from the right. This time, his ball found Altidore on the penalty spot, but Jozy couldn’t put it on target, heading over. In the 53rd, a backpass under pressure to Pyatov resulted in his clearance only reaching Bedoya, whose first-time shot with the outside of his boot whistled just wide. Then, in the 54th, a great ball from deep in midfield by Jones found Dempsey sprinting into the box, but Pyatov met him and blocked his shot. In the 63rd, Brek Shea and Aron Johannsson came on for Castillo and Kljestan, and the U.S. shifted into a 4-4-2. Shea made an immediate impact, winning a free kick and earning his fouler a yellow card in the 64th. However, just as U.S. pressure seemed sure to tell, Ukraine scored a second. With the U.S. high up the field, a ball over the top left the U.S. center backs for dead, with Ukrainian substitute Marko Devich racing onto the ball and straight at Howard. Howard did very well to save Devich’s first shot, but the rebound came back to him, and Devich made no mistake at the second attempt. The goal deflated the U.S., and in the 73rd, Ukraine almost had a third. A poor pass from Jones wasn’t handled well by Brooks, and the ball fell to Yarmolenko in the center circle. With Howard off his line, Yarmolenko went for the long range chip. Howard, losing his footing, could only shove the ball out for a corner while lying on the ground. The game sputtered then, with Ukraine content to be in front, and the U.S. unable to do anything productive with its possession. 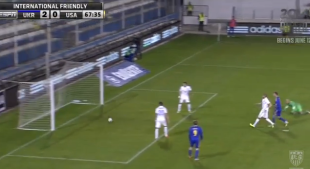 Late on, though, Johannsson nearly grabbed a spectacular consolation. In the 87th, a U.S. corner looked to have been hit too long by Bedoya, but Johannsson was there on the far side of the box, and lashed a vicious left-footed volley at goal, only to see the ball cleared off the line. It was the last good chance of the game, and Ukraine ran out two-goal winners. Rising stock: In fairness, almost no one improved their standing for the World Cup. Johannsson proved yet again how electric he can be, and Shea showed he’s still a good option off the bench to inject pace and directness into the side. Tim Howard remains Tim Howard, making several great saves, only to be undone by poor defending. None of this is a surprise. Falling stock: The Onyewu/Brooks pairing was poor. Brooks is too raw, and Onyewu too rusty, and together, they never looked comfortable. Castillo also did himself no favors, getting repeatedly roasted by Yarmolenko in the first half. Kljestan, while not bad, probably needed to do more to ensure a roster spot for Brazil. Jozy Altidore: Altidore looked okay, but nothing like the unstoppable force of the spring and summer. Jurgen Klinsmann still sees him as the starting striker for the U.S., and when in form, he deserves that role. However, he needs to find that form (and some service) sooner rather than later, or the World Cup will be over for the U.S. far too soon. Clint Dempsey: Dempsey had a few moments today, but in general was fairly anonymous, which is how you could describe much of the last year for him. Something needs to wake him up, as he is too important to the U.S. to be playing so indifferently. During the first half, Ukraine was effervescent at times. Their wide players were nearly unstoppable, and the U.S. certainly didn’t look capable of managing it. The U.S. performance improved dramatically in the second half, but was undone by another defensive mistake. While fans may have hoped to see better performances, all data is useful right now, and Klinsmann will have confirmed that his first choice players, most of whom were not present in Cyprus, are the correct ones. Players like Onyewu just do not offer enough to earn spots. Some thoughts in the game: I thought Dempsey was just non-existent. The back line was (predictably) terrible. I still fail to see what anyone sees in Jermaine Jones. Altidore is slumping badly and needs to figure it out come June. Aron Johanson (probably spelled wrong) is an absolute stud. The game didn’t mean anything but I agree that no one (who needed to) really made a case to go to Brazil. Look on the bright side: ONly ONE person sees something in Jones. I almost typed that the defense was clearly the biggest worry going into the world up, but then I thought about the offense… Honestly I think the funk of Dempsey is problem number 1. From what Klinnsman said Bradley/Jones, Dempsey, and Altidore were all locks to start. What happens when 2-3 out of 4 of those are out of sorts? That could spell doom for the US. I think Jozy will work himself out, but there’s something about Dempsey that’s just not right, like he’s in a coma or something. I really hope he wakes up soon. I think it’s pretty clear that Johannsen needs a spot to start, no doubt about it, find a way Jurgen. Drop Jones and go to the 4-4-2. That may give Johannson room AND help Jozy. Please put Castillo on a shelf somewhere and don’t bring him back out.